This comes with a warning: it is better than you dare dream. The recipe comes from my trusty Wagamama cookbook and is adapted only slightly. Served warm, and cooked quickly in the fragrant marinade, this makes for a perfect winter salad. The bean sprouts are totally optional. You could co without or substitute with cabbage or bok choy. The next time I make this salad I'm going to pile the spouts up on the side of the greens, uncooked. For the beef, I highly recommend the super lean sirloin steaks sold at Trader Joe's. This particular sirloin has just 2 grams of saturated fat per 4-ounce serving. Of course the real beauty is the marinade; I suspect you could substitute shrimp, chicken or pork with fantastic results. You could add additional veggies to the salad - carrot, julienned Bell peppers, mushrooms or grape tomatoes. Or, make it into a pasta dish by serving it on a bed of thin rice noodles, much like the Beef Salad at Simply It that I like so much. Prep everything, starting with marinade. 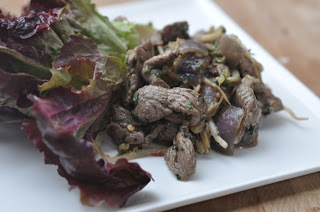 Combine sliced beef and cilantro marinade and toss to coat. marinate for at least 1 hour, or up to overnite. I did it for about 45 minutes and was thrilled with the result. While beef is marinating, or 30 minutes before you plan to eat, make the salad dressing and prep the salad veggies. Then get ready to cook. Heat a wok or large skillet over medium heat. Add 1-2 T canola oil. Add the red onion and saute for 3-4 minutes, tossing every so often, until slightly caramelized. Increase heat a bit and add beef (with marinade), cooking until browned and mostly cooked through. Add bean sprouts and cook another 2-3 minutes, then remove from heat. Toss salad greens with veggies, cilantro, dressing and portion onto dinner plates. Top with beef and serve.